I know I love to dance - and so do kids! Dancing is such a fantastic way for kids to exercise and express their creativity. I am a teacher and I would frequently use music with short little routines in my classroom. We would sing and dance about reading, math, history ... kids can really express themselves thorough music! So when I sneak in the learning aspect of the dance routines, they don't mind! When the students start getting a little restless or they have been sitting at their desks for too long, I might put in some music and let them get their wiggles out! They *love* it! When you combine dancing with the beloved Curious George, you have yourself a party! Kids love Curious George! Now you can have them show off their best monkey moves and exercise their creativity in the first-ever Curious George Dance Contest! During its sixth season on PBS KIDS®, the Curious George television series is featuring a special focus on the arts, including dance. Dance is a great way for kids to express themselves, and a fun way to exercise! Parents and guardians are NOW invited to enter a video of their child dancing to the Curious George theme song for a chance to be featured on a Curious George DVD! You might even win a visit from George himself! Whether your child likes to bop, shake, jump, twirl, or spin, we want to see how they boogie along with Curious George. “We love to see how kids are inspired by George’s contagious curiosity and unending enthusiasm,” says Senior Vice President of Animation Production for Universal Studios Family Productions Ellen Cockrill. “Through movement and dance, kids can be creative, curious, and may even discover a new passion or artistic outlet. We’re excited to see what kids come up with. 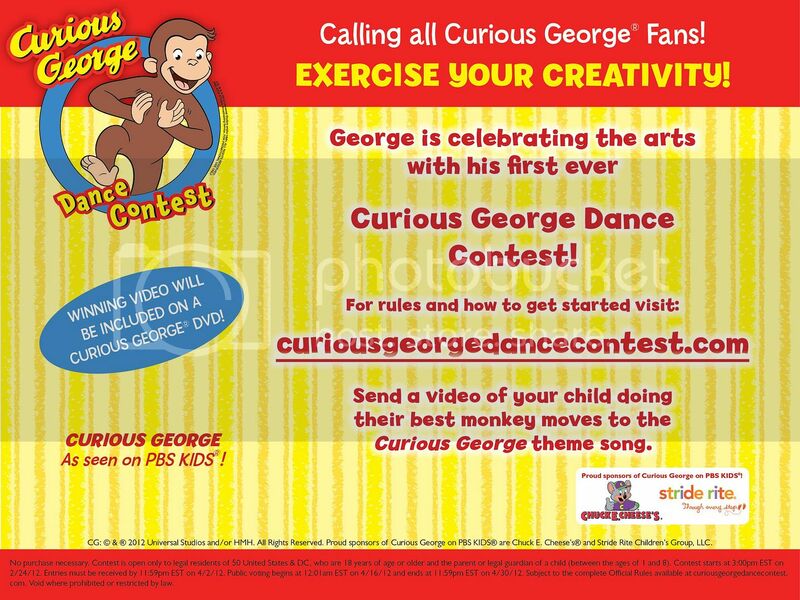 Contest details: Parents and guardians are invited to enter a video of their child dancing to the Curious George theme song for a chance to be featured on a Curious George DVD. They might even win a visit from George himself! A panel of judges will review the video submissions and pick 10 finalists. Enthusiasm, creativity and originality are key! Contest ends April 2nd. For more information, please visit CuriousGeorgeDanceContest.com. Disclosure :: This post is sponsored in collaboration with Latina Bloggers Connect and WGBH. See my full disclosure. Image CG (R) & (C) 2012 Universal Studios and/or HMH. All Rights Reserved. FOR PROMOTIONAL USE ONLY.